They talk their new poetry book, their spoken-word album, and the weight of Trump's America. Poet Andrea Gibson would likely find a better word to describe themselves than “inspiration,” and yet: they’re an inspiration. Gibson, who is genderqueer, writes material that can resonate with anyone, but is especially meaningful to those who identify as LGBTQAI—their work tackles everything from the coming out process to white supremacy to mental illness to plain old romantic love. They are both punk and honeyed, radical and comforting. Gibson, 42, has been writing and performing for years, but they are perhaps best known for a viral video of their poem “Your Life,”which serves as a pep talk of sorts to a younger version of themselves, encouraging a teenage Gibson to choose a “hard life”—an honest one. If you have not seen it, be warned that if you watch it, you will cry. You will cry a lot. Now, Gibson is promoting two recently released projects: a book of poetry called Take Me with You, and their seventh spoken-word album, Hey Galaxy. And thankfully, a conversation with Gibson is exactly what you’d want it to be: insightful and soothing, with their words rousing one to simply do better. They’ve been on tour for ages with a couple of puppies—so we spoke from the road about their new projects, how the election has affected both their emotions and their work, and what it’s like to talk with young people who have yet to come out. OUT: How would you describe each of the projects? 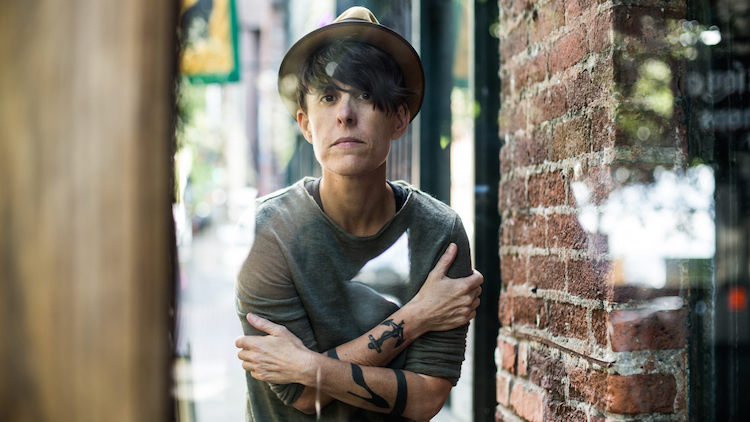 Andrea Gibson: I was working on an album, a record that I wanted to be just this beautiful album that I printed on vinyl that was entirely about love—romantic love. And I wanted every track on the piece to be a love poem or a heartbreak poem, and then Donald Trump got elected and I couldn't stomach that being the project that I put out directly after that. I wanted to do something more political. And while the album still has love on it, it's got lots of just social justice themed poems, and it's talking about everything from white privilege, white supremacy, mental illness, sexuality, gender queerness. It talks some about addiction, class, but also self-love. The book is broken up in three sections, and one section is on love, one's on “becoming,” and one's on social justice. And with that project, I wanted to make something that people could pick up and get immediate inspiration from. So it's an illustrated book of not necessarily quotes, but shorter lines or thoughts or concepts, shorter poems. It was around the time that every ten minutes all the awful news was popping in on my phone, so I wanted to make something in a smaller book, where people could just pull the book out of their pocket and counteract some of that. That doesn't mean to suggest at all to not follow what's happening in the news, but also to offer some light or some hope in the midst of it. Sorry to drag you into this, because it's torturous to talk about for everybody, but could you put into words how you've been feeling since the election? It's obviously influenced your work a great deal. Do you feel like you have a lot of responsibility to tackle what's going on? Does it weigh you down? So, I think the day after the election, I experienced something that I had not felt before. It was sort of an immobile, political despair that was really brand new to me. I mean I've obviously felt grief about the world throughout my life, but it was something new that day. It was 3 p.m., I was still in bed, I had a show to do that night in North Carolina, and I remember calling my therapist and my therapist answering from bed. Everybody was just so heartbroken. I feel like my mood goes from despair to fear to outrage to hope and possibility. The day after Trump was elected, I kept thinking of the word apocalypse. It just kept coming to me in this sort of terrifying way. And then somebody told me recently that one of the definitions of apocalypse is a time when things get revealed. I can see that for sure. And so that gave me some hope, because one thing that's happening is things aren't hidden in the way they might have been before. I think all of this ugliness, all of this bigotry, ignorance, hatred, this horrifically racist president. All of that was part of our country before he got elected, and one thing that he's doing is he's saying yeah, this is absolutely here, there's no denial of it. So I guess the more obvious something becomes, then maybe we have a better chance of really fighting it. I don't know. That's one thing that goes through my head when I'm trying to put a positive twist on things. But, you know I feel so many different feelings. And then I also feel so much gratitude and so, so blessed to have so much community where I watch everyone just doing everything they can, pouring their hearts into making things better and creating beautiful art, creating connection. I see communities that weren't previously really working together starting to work together. Like for instance in Colorado, a lot of immigrant communities and LGBTQ groups are working together in a way that hadn't prior to the election. And so I feel inspired by that, and I also feel scared. I feel scared a lot. And the show, the book, the album—they sort of speak to all that. All the different feelings that have been coming up in the last year. Your poems are inspiring for young, queer people. After your shows is there anything that young people come up and ask you about? And is there anything that you’d want share with younger readers? You know, those times after shows, when I'm signing books and stuff in the merch line—those have always been some of the most special moments of tour. Often I'm out talking to people for longer than the length of the show. I meet so many amazing people, and one of the things that I think about every time I'm onstage, I think about how some people came here alone, and they came because they didn't have anybody else that they're out to, and they came nervous to come alone. And some people came here sneaking out of their parents' house, or saying that they're spending the night at so-and-so's house. And just we all come to it differently. So I talk to a lot of people, specifically young people, about their process. Almost every night somebody will tell me just in the last week they came out to their parents. And it's an exciting thing to see, because they're at once excited and then also terrified, and ... what would I say? I mean, the thing that I think of the most is how important it is to celebrate ourselves no matter what age we are. But to celebrate ourselves for exactly who we are right now, and to find people who will do that and surround ourselves with people who are loving us as exactly as who we are right now. And the coming out process for me—I had a family that I thought would never, ever come around. So I know that experience, and I think it's unfortunately common that many parents and families don't. But it's also happens that with some time, people change their perspective on things. It’s just so special about meeting people at the shows because there are so many people where you can tell that they're willing to have their minds changed. That was one of the most transformative times in my life, when I recognized how quickly my mind was changing, and how willing I was to have my mind changed, and how important that was to my growth, and also to whatever my mission or goals are in terms of my art, to be somebody that can be wrong. That can be wrong and learn from it and then try to do better.